Using Digital tools to enhance and transform your classroom collaboration, empower the student dialogue, and transform communication within and outside of our classrooms. 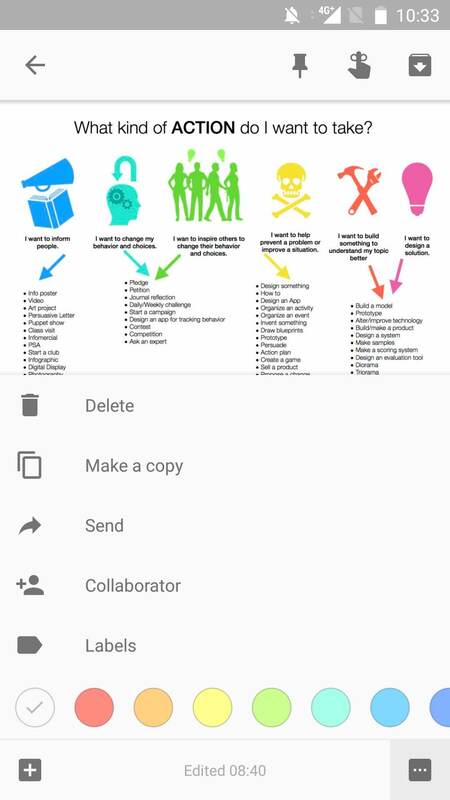 In the PYP Enhancements, we are now more aligned with the MYP and DP with our Transdisciplinary Skill Clusters and more explicit of how digital citizenship is affecting learning and teaching. By integrating our learner profile attributes with an understanding that digital citizenship is a just citizenship with a digital context we are more than capable to support our students needs. Our students need us, teachers, to become digital citizenship leaders. These skills and dispositions aren’t a one-off class that we can deliver in August and then forget about it. We need to weave the technology into the very core fabric of our pedagogy in order to facilitate for Authenticity and Relevance. Here are two of my favorite, with an abundance of specific examples, about how to explicitly teach citizenship and skills within the PYP and a digital context. Bring this concept into the digital age by explicitly teaching collaboration in digital spaces. Consider using a framework like T-A-G in your collaborative digital spaces like Seesaw or G-suite for Education. Using this model to practice providing constructive feedback in digital spaces is an important first step into authentic real life skills. Google Keep must be Google’s best-kept secret. This versatile mobile app works beautifully on the desktop adding value to your Docs, Gmail, etc. What makes this app really useful is that it is completely platforming agnostic, therefore allowing everyone to use their favorite device and OS. PRO TIP: You can share your Keep Notes and have students, teachers, and mentors contribute simultaneously. Google Slides is a lot more than a presentation tool. A shared planning template can be used to curate your multimedia and multimodal material needs. Teams can use speaker’s notes area in addition to messages for communications and criteria and/or messages to assign tasks after meetings. Hangouts / Meet have almost wholly replaced email since it allows for instant communication and/or video-conferencing. 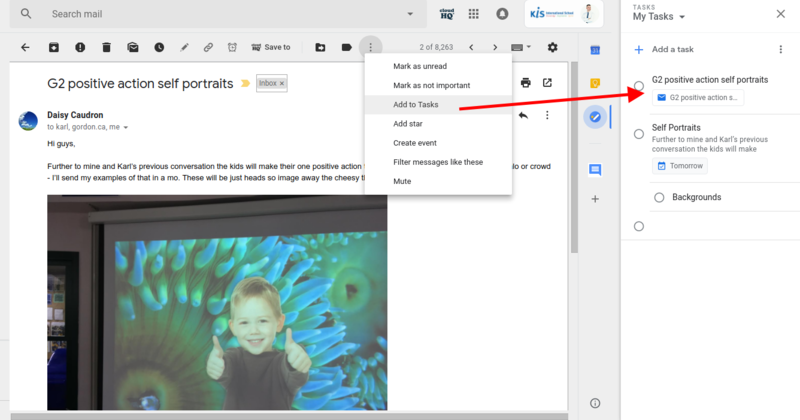 This will also allow you and your students to transform your use of email as assignments and todo-depository. Google Classroom as a fronted to Google Drive and Calendar. To fully comprehend Google Classroom and utilize it effectively picture it as a usability layer on top of Google Drive. Teachers and students can use it to curate files, forms, links in a very effective way to make sharing and collaboration meaningful. Team drive is a hassle-free addition to Google drive that eliminates the sharing step from your files, everything that is uploaded into your team drive is automatically shared with your team and the ownership is transferred to the domain. Therefore, when posting and sharing your planning through google classroom you don’t have to worry whether your team members have access to shared documents or not, the answer is always yes. Team drive also can serve as a resource folder for documentation and evidence collection. Team drive is also great for sharing photographs across departments and teams. Google has unveiled a huge update to Gmail. In addition to a new look, Gmail has new features that will impact how you manage your inbox and even the messages you’re sending to others. These changes vary from User Interface to actual Collaboration enhancements, on the right side, you’ll see a strip of icons that link to G-Suite apps: Calendar, Keep and Tasks (a new addition that lets you manage to-dos). You can now appreciate having a quick link to your calendar close at hand direct from Gmail. You can either add meetings inside the sidebar or edit directly in the caledar app. Tasks In addition to Calendar we now have an option to include Tasks by either clicking directly on the field or using the Menu option. When using the Add to Tasks Gmail automatically tags your task with the open mail. 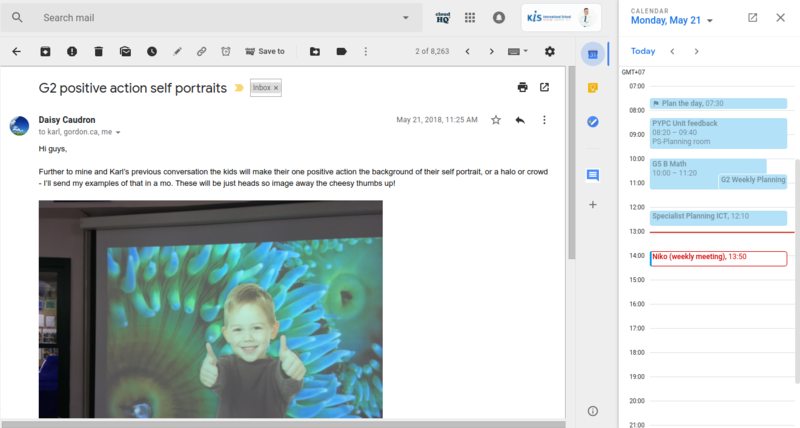 PRO TIP: Email large attachments via Google Drive! There’s a little Drive icon at the bottom of Gmail’s compose window. It lets you attach files you have stored in Drive or simply send a link. For Google Drive formats — Docs, Sheets, Slides and so on — your only option is to send a link to the file. For other file types — PDFs, Word docs, images — you have the option of sending them as an attachment or a Drive link, which lets you share files larger than Gmail’s 25MB size limit for attachments. Students are ready and willing to be responsible citizens. We need to provide them opportunities to witness responsible and balanced use of digital tools. To effectively and explicitly you model the behavior you wish to instill during regular class time – and then reflect on the experience. Every unit has time when students are researching in class. This is an apt opportunity to discuss with students how they can make the best use of their time by using a focused tool like the Big 6 research tool and set up your physical learning environment to mirror the needs and skills of the virtual one. Setting a timer for focused work time, and then a short break. Pro TIP: you can also teach The Pomodoro Technique: a productivity philosophy that encourages 25 minute work periods followed by five minute breaks. Proudly powered by WordPress | Located: IS Mainfranken in Schweinfurt.